It is everything I thought it would be. It is made of Henry's Attic Cascade Petite (100% silk and shiny) held together with JaggerSpun Zephyr (50/50 wool/silk and matte) on a #6 U.S. straight needle. Thanks to a suggestion from The Scarlet Knitter, I stopped knitting after 17 repeats. The shawl blocked to 22" wide by 68" long - an excellent length. Guided by Laura, I realized that a longer shawl would look like a costume. This one looks, again, perfect. "More pictures?" you ask. Why yes, I do have more photographs. The one below is of the shawl being blocked on towels which are set upon my nifty new pinable floor squares. 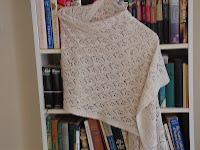 The next photo is of the squares themselves laid out in a rectangular shawl configuration. I didn't need to use many pins; I used a yardstick to straighten the edges. Stay tuned to this space for stories to come featuring short row heels. Interesting that you used straight needles. 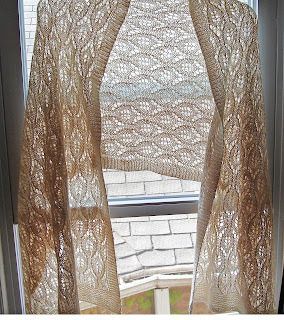 I have been struggling with a circ for my lace stole, because the collective wisdom of those who know better than I (pretty much everyone when it comes to knitting lace)mandates circs for lace shawls. But it's driving me crazy. Once moved to the cable, the yarnovers seem to shrink and refuse to go back onto the needle. This is lovely. It has been on my list ever since I bought the book, eons ago. You just may be the one to give me the momentum to start. Great work, lovely shawl. Thanks CCK and Wool Enough. Usually I am more modest about my kniting, but I really am thrilled with this. It looks SO much better in person than in the photos. Do it CCK! It is actually an easy and soothing knit. You are inspiring me to join afghans for Afghans. It is stunning. I am so impressed you knitted lace holding two strands together. I have seen and admired Zephyr before but have yet to meet the Henry's Attic silk face to face. I have had this book for years but have still to cast on for one shawl in it, even though I love the idea of knitting shawls in heavier yarns than laceweight.